As a kid who grew up in Canada with natural gas heating, cooking and a natural gas clothes dryer, it’s great news to see that a Canadian company, the Bontan Oil and Gas Company, based in Toronto, has found what could be up to $6 billion dollars worth off natural gas off the coast of Israel. This could mean even cleaner energy for Israel which has no formal diplomatic relations with its Arab neighbours who own oil. While natural gas is not the cleanest fuel out there, it does burn cleaner than oil. The Jerusalem Post reports that the Canadian company had been exploring for natural gas off the coast of Israel, and announced yesterday that it had located what appears to be up to 6 trillion cubic feet of natural gas off Israel’s coast in two separate sites. 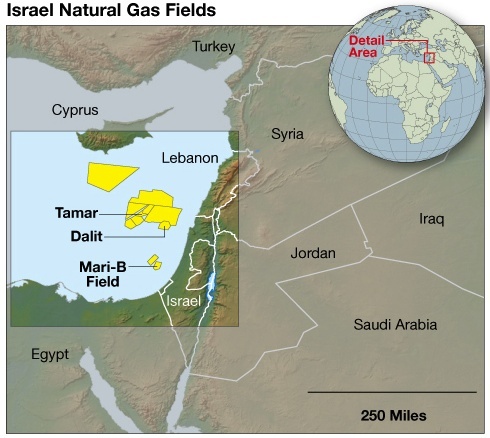 The two gas fields called the “Mira” and “Sarah” prospects are located just south of the Tamar and Dalit gas fields, where Delek Group Ltd and its partners, Noble Energy Inc, Isramco Ltd, and more located natural gas fields last year, with an estimated worth up to $40 billion. The new finds are in adjoining 154-square mile blocks found 50-100 kilometers from the Netanya-Hadera coast. They are not included on the above map which shows the gas finds made last year. Does the Environment Lose in Natural Gas Find?